Its has already been reported today that Xiaomi has surpassed Samsung to become the top smartphone vendor in China, and now details have been released by the company revealing that 15,000 Xiaomi Mi3 handsets which wen ton sale today have been all sold in just two seconds in India. 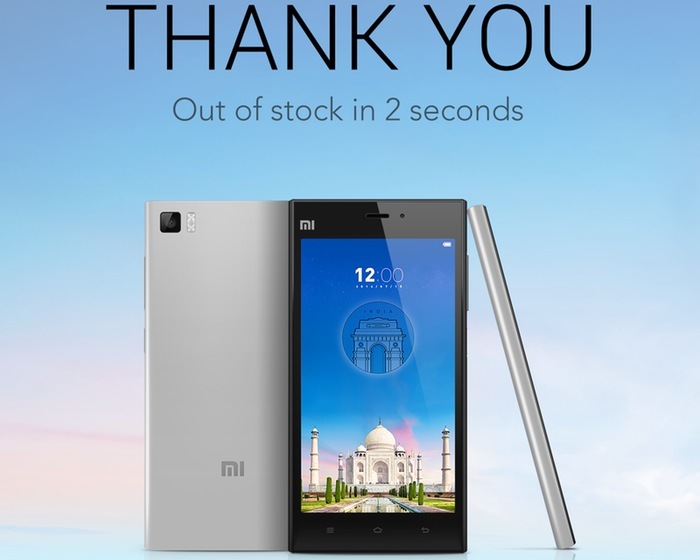 Before todays sales 20,000 units of the Xiaomi Mi3 have been sold in India in two batches with the first being sold out in 38 minutes and the second 10,000 units being sold in just 5 seconds last week. To re-cap the Xiaomi Mi3 is equipped with a 5 inch IPS display offering a resolution of 1920 x 1080 pixels, and is powered by a quad core Qualcomm Snapdragon 2.3GHz 800 processor supported by 2GB of RAM and 16GB of included storage. Other specifications on the Xiaomi Mi3 smartphone include a 13 megapixel rear camera, complete with a dual LED flash and auto-focus. Xiaomi has also equipped with handset with a 2 megapixel front facing camera and 13 megapixel rear facing camera, and support for WiFi and Bluetooth connectivity all run on Google’s Android 4.3 Jelly Bean operating system. As soon as Xiaomi announced the availability of more Mi3 smartphones we will keep you updated as always.